It’s a challenge every month to spot the New Moon after sunset by naked eye (or eyeglasses) as early as possible. I use the term New Moon in its classical sense of one’s first sighting of the Moon after its monthly solar conjunction (Dark Moon). The Dark Moon (which some call New Moon) will be in geocentric longitudinal conjunction with the Sun on 2018 JUN 13 at 19:43 UT (14:43 CDT). During the half year prior to the Summer Solstice, sighting a very young Moon is usually easiest. Many observers on either side of the Atlantic with clear skies should be able to spot the crescent Moon after sunset when aged a day or more on Thursday, June 14. It will be seen to the left of Mercury and well to the lower right of Venus. Photos and descriptions of this month’s young crescent Moon would be welcome additions to this thread. 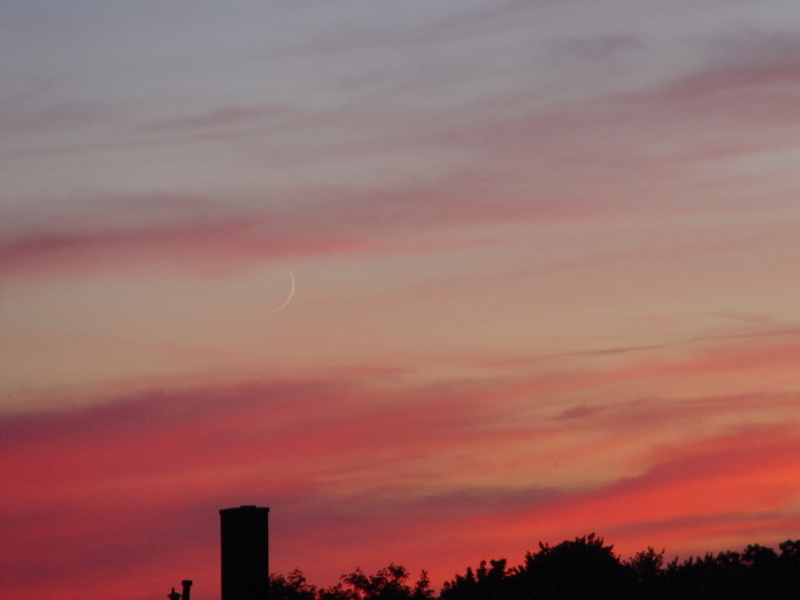 Below is a photo I took from Arlington Heights, Illinois on 2011 JUL 02 at 20:58 CDT when the Moon was aged 1.7 days. Further down is a depiction of how the Moon will appear in the Chicagoland western sky after sunset on 2018 JUN 14. Always fascinating to see a lovely thin crescent at sunset, particularly if there are some other notable objects nearby.